In our latest visit to one of the Barcelona's fine eateries, we stumble upon a version of an old British favourite JOSEP LOSADA. 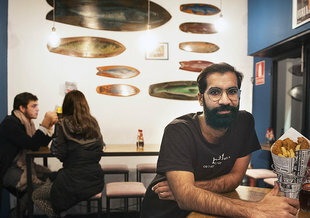 Co-owner Mani Alam with the restaurant’s eponymous dish JOSEP LOSADA. The Balmes branch, exterior. JOSEP LOSADA. The Balmes branch, terrace JOSEP LOSADA. Fish and chips in Barcelona? Can’t be like the ones I get back home, surely? 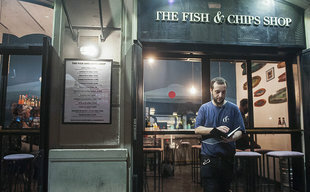 Well you’d be right there, because the range of food on the menu at this small chain of fish and chip shops that has sprung up in the Catalan capital since 2015 takes the concept of this traditional British dish to a whole new level. And let’s get this straight from the start, despite the relatively economic pricing of the dishes, the quality of the food is amazing, not least the fish itself, which is about as fresh as you could hope for and just melts in the mouth in the way flaked white fish is supposed to. Owners Mani Alam, his brother Magid and brother-in-law Bilal, opened the first Fish and Chips Shop on Gran Via/Rocafort in February 2015. They had spent time in London and realised there was a business opportunity to be had in Barcelona, given the popularity of the concept in the UK, especially as takeaway food after a night out. 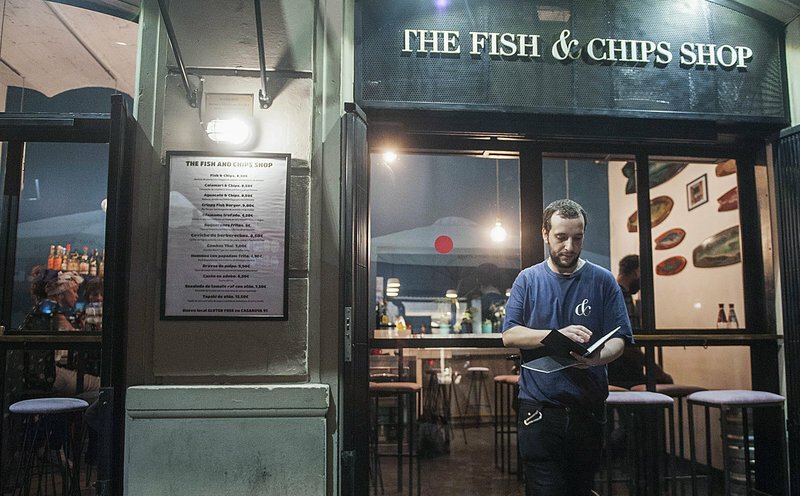 But they decided to go a step further and develop a truly eclectic deep fried seafood menu, including not just fish and chips but also calamari and chips, avocado and chips, octopus bravas, and many more. With the success of the first branch, they quickly opened more, and the total now stands at five, the others being on Balmes above Diagonal, Aribau near Pl. Universitat, El Raval and a new one on Casanova above Aragó. The Balmes branch, which is where we met for a chat, soon found a loyal clientele in this uptown neighbourhood: locals keen to bring their children to sample the UK’s most famous culinary dish mingling with ex-pats living in the area craving familiar fare from home, and office workers in search of an inexpensive lunch or after-work option. 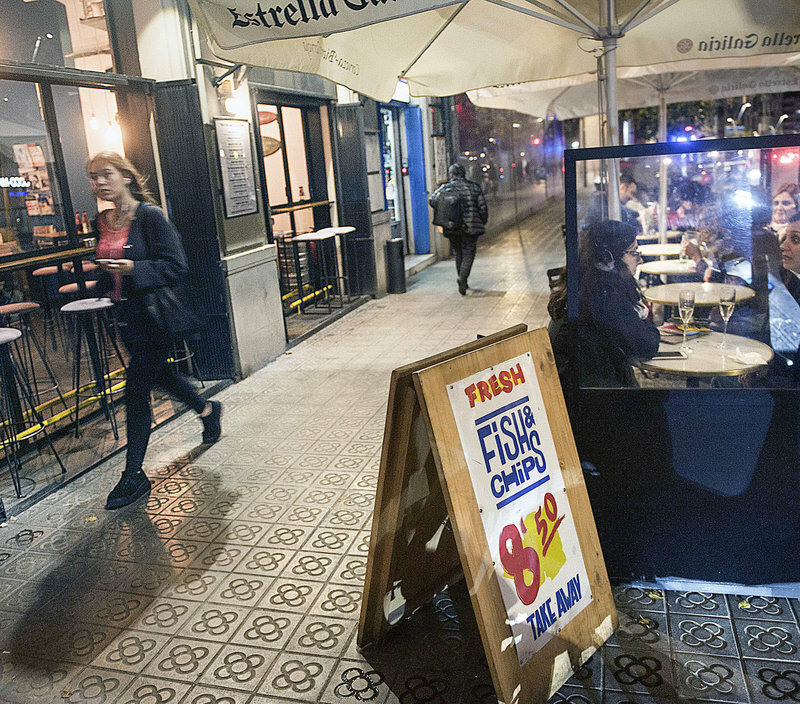 “We didnt mean to open so many so quickly,” Mani tells me, “but we kept getting offered places without having to pay a transfer fee (traspàs) and it seemed to make sense to keep expanding.” The only branch that isn’t small is Aribau, because it has a cocktail part which is open until 1.30 am. The kitchen is open in all branches from 1.00 pm onwards, most likely another reason for the chain’s burgeoning success. However, despite the UK tradition, takeaway was never the idea for the shops here, the three entrepreneurs starting the business as purely a restaurant before people started asking for delivery. Now they have eat in, takeaway and delivery. 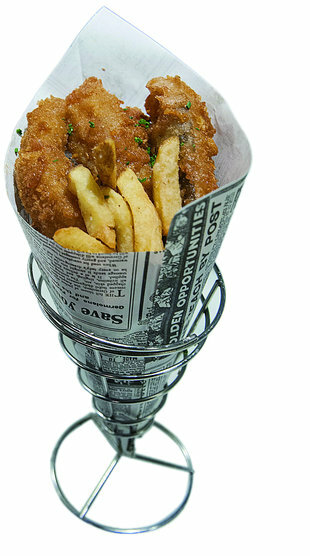 Aware of the less healthy element of deep-fried food, the menu uses vernacular English to encourage diners to partake in the restaurant’s fare. “F*** diet and eat fish and chips” being its widely advertised motto. So what of the food itself? In terms of presentation, although it’s not actually wrapped in paper and then newspaper, as was the traditional UK method before hygiene rules kicked in, it is presented in a charming little metal stand with a nod to the traditional newspaper wrapping in the form of decorated paper. As for quantity, you won’t get the traditional half a kilo’s worth of chips, but rather just the right amount, in my book anyway. But then I’ve never been a big lover of fried potatoes myself. The fat soggy ones I got used to as a Manchester teenager were always my favourite, but these are far from that, and quite up to standard if you like your chips thin and crispy. And they also leave the skins on, which I’ve always liked. The menu is varied and has been created using the ideas of the three owners but also employees. “We know how to listen because we’re not professional cooks, so we just pick up ideas from other people,” Mani continues. They change the menu slightly every few months, and there are also slight differences between branches: for example, the Raval branch is the only one with razor clams. Another popular dish we tried was octopus in Japanese wheat breadcrumbs (panko) with spicy mayo (which has kimchi and flavours from South America). Mani and his co-founders like their spicy food, so there are lots of spicy options on the menu, and even the fries have some curry powder for extra flavour. Are the locals not known for steering clear of spicy food? “Maybe 10 to 15 years ago, but it’s changing now people are travelling much more,” Mani says. “At the beginning people did say it was too spicy but we didn’t change,” he smiles. They now have 30-35 employees in the five locations, and the new branch in Casanova is to become completely gluten-free, including the beer, as a response to more and more requests from customers. So what does the future hold? Even more branches? “Well we would like to expand more, but perhaps not here, in cities around Spain, and maybe further afield. London maybe?” Another cheeky smile, but why not? This is a kind of fish and chips you won’t find in England’s capital.